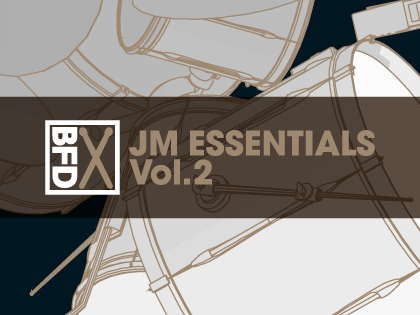 JM Essentials Vol.2 is a BFD Groove pack that provides a realistic set of reggae, funk, disco, swing, rockabilly, nu-metal and punk patterns for FXpansion's BFD3, BFD Eco and BFD2 acoustic drum software instruments. Produced by experienced composer Jacques Mathias, JM Essentials Vol.2 contains expressive patterns that offer a realistic foundation on which to build your productions. The included Grooves are ready to be used as-is or edited to your requirements and feature the convincing feel of a real drummer. Each supplied palette features up to 50 Groove and Fill variations, with the pack containing over 1300 patterns in total. Palettes are supplied in BFD3, BFD Eco and BFD2 versions. JM Essentials Vol.1 is also available.